I didn’t even read the synopsis first when I saw this book available to request on NetGalley. The title was enough for me, so I had no idea what I was getting into when I started reading. I really love the blurb now that I have read it, and it would have enticed me to read the book, but going into chapter one with no idea was quite the trip-down-the-rabbit-hole. I’m not sorry I got to experience it blindly! This novel is unlike anything I have read before. Each time I thought I was starting to get it, it would change on me just enough to get me guessing again. The characters are each unique and vibrant individuals, no small task considering the same man was inhabiting several of them, and the story is beautifully written. Even without the element of mystery, I would have been hooked. It’s a story I can’t say too much about without giving things away, but I can say that it was the best thing I’ve read in ages. 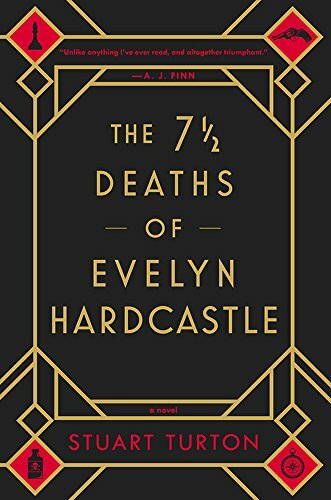 One last note – if you go looking for this book on Amazon or Goodreads, know that you will find it listed as both The 7 1/2 Deaths of Evelyn Hardcastle (the American title) and The 7 Deaths of Evelyn Hardcastle. Same book. Whatever the title is where you are, pick up a copy and read it! Everyone I know who has read it, loved it. I hope you do too! This definitely sounds like a very unusual story. I will have to see if this is one I want to read or not. Wonderful review Erika. Thanks Carla – it is definitely unique! Very good review of what would be an unusual book. Thanks for the insight.